It’s been ages already since Vancouver’s one and only Michael Riches first began assembling, burning and mailing my way comp discs chocked full of both current, classic, obscure and even vintage Japanese pop music. Yet despite the abundant audio treasures discovered therein (ie: The Spiders’ “Revolver”-and-THEN-some “Mr. Tax,” to cite but only one) it was the delightfully pseudo-retro bazaar known as Puffy which, I must admit, hit first, stung hardest, and rooted deepest. Immediate further investigation led me straight to this ear-boggling duo’s 1999 opus “Fever Fever” and, dare I say, its Andy Sturmer-supervised mishmash of Merseybeat/metal/surf/ABBA/Tammy Wynette and/or “Who’s Next” recasts clearly makes for one of the most captivatingly clever carnivals-of-sound this whole world has ever offered. Recently the band (now sometimes called Puffy AmiYumi, under threat of legal intervention from the Puffy Daddy himself) performed to a sold-out throng in New York City for the very first time and, of course, I couldn’t help but squeeze my way inside. Lean, mean, and scaled down somewhat from the larger, inflatable kitty-festooned all-ages extravaganzas they're well known for at their EnormoDome presentations back home, the intricacies of Puffy's patented Sturmer-styled J-Pop nonetheless rang through, LOUD and clear, with namesake vocalists Ami and Yumi gamely fronting it all with a more Ramones-meet-TLC rather than Pink Lady approach to be sure. More refreshing still was the absolute and utter lack of pretension proudly displayed throughout: Indeed, this is one band never ever afraid to laugh at themselves (and, you bet, with the audience). My, WHAT a Concept! Now, in the spirit of those who have wisely already learned to check their grey matter at the door before indulging in all things Puffy I present below an instant, heartfelt report filed by my fellow Canadian Martin Goodman, another recent convert to the cause who caught Ami, Yumi & Co.’s maiden North American tour at its last stop in Toronto. And, in deference to Martin’s true fandom-driven fervor, I’ve resisted the urge to edit or otherwise tamper in any way with my good friend’s wondrous wide-eared words; hopefully the joyful sentiments each and every consonant fully express can be received and reveled in the true spirit they are humbly, happily offered. That all said, remember when you’re finished to go grab a Puffy disc or three for your very own driving and dancing pleasure, okay? Ready then? Take it away, Martin! The fabulous pop duo Puffy AmiYumi from Japan has just completed their first North American tour. The “Rolling Debut” Tour started in West Hollywood, California at the Roxy Theatre and finished in Toronto Canada, at the Opera House. As I make my way to the front of the club there is already a line up around the block. I’m thrilled to see so many Puffy fans here. When I turn the corner to take my place in line, parked right in the street is Puffy AmiYumi’s tour bus and equipment van with license plates from the states of Oregon and Alabama. This band has come thousands of miles to come to Toronto and the fans excited with anticipation but beautifully polite and respectful of each other knew this was going to be a true rock and roll night. Inside the concert hall I made my way past the refreshment bar and walked up to a small railing in front of me. The hall was packed with fans and I was lucky to find standing room only. The lights were off except for the front of the stage which was bathed in white and purple spotlights. To the delight of the crowd the opening act Bleu came on with their own brand of catchy pop rock tunes. The five-piece band rocked the crowd and thank Puffy for a wonderful time on tour with them. Much to everyone’s surprise Puffy came out to help Bleu sing their last number. The road crew came out to ready the stage for Puffy AmiYumi, and as a guitar technician strummed pop power chords a roar rose from the audience. The house lights went out and Puffy’s five-piece band came out and kicked off the show with a hard rocking number “Into The Beach.” Puffy AmiYumi sang with enthusiasm and energy. Their next song “Love So Pure,” their only song sung in English and is a classic pop song with tight harmonies by Ami and Yumi and solid backing by the Puffy AmiYumi band. Fumio the guitarist on the far left of the stage came out waving a hockey stick and wearing a Maple Leaf flag around his shoulders. The crowd erupted in a roar as Puffy and the band performed their first big hit “True Asia,” known in Japan as “Asia no Junshin.” Ami and Yumi’s melodic vocals fit in well with the backing keyboards and guitar riffs. The next song “Brand New Days” wowed the crowd sounding like Puffy meets Paul Revere and the Raiders with Ami and Yumi dancing to the rocking organ. Next came “Jet Police,” their big smash hit. The whole band started dancing to this song with the guitarists Fumio and Takashi doing jumping jacks in mid air and Yumi and Ami dancing all around them. Ami and Yumi pause to talk to the audience in English using written cards to help them. Ami said in her best English, “We have been to Niagara Falls it is beautiful, we would like to come back there on a holiday. It has been an emotional and physically hard tour but we would like to thank Sony Canada, all our fans, and Japan or we would not be here. Lastly we would like to say that Puffy is all the people who work with us.” The audience cheered. Ami then said very heartfelt, “We would like to do a few more songs and we will try our hardest here in Toronto, so let’s rock the house!” The whole club went nuts. As the band’s drummer Takashi Furuta started the opening beats of the incredible song “Boogie Woogie No. 5” the crowd exploded dancing, jitterbugging all over the place. Ami and Yumi were dancing at the front of the stage when the band’s road crew came out and form a chorus line with Ami and Yumi. The audience screamed out its approval. As Takashi laid down his solid beat the girls’ harmonies soared. As the band went into the bubble gum classic “Neholina” guitarist Fumio threw into the crowd florescent glow sticks which the crowd waved in time with the music. 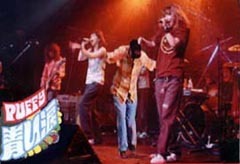 “Puffy’s Rule” ended the band’s show with the rocking upbeat number. Bleu, Puffy’s opening act came on stage, with flowers red roses, for all the band members including Ami and Yumi. To wild applause Puffy thanked Toronto and every one for coming. Puffy and the Puffy AmiYumi band with great style, and class, they played their hearts out and Toronto rock and roll fans including me can’t wait to see them again. God, bless Puffy for making music rock and roll again. Thanks to Doug Pelton, extra thanks to David Wheatley for all AmiYumiMarty pictures and very special thanks to Gary Pig Gold.